This morning fire disrupted voting exercise at Soweto Resource Centre and Undugu Society polling stations in Nyayo High-rise ward, Langatta constituency. Residents left the long queues and rushed to rescue their properties. One of the residents identified as Kamau, said he could not continue queuing when he is not sure he will spent the night after his house was destroyed by the morning fire. “I can’t vote when am not sure whether this people will remember us. Wacha niokoe mali yangu. Let me save my property.” Said Kamau. No casualties have been reported. 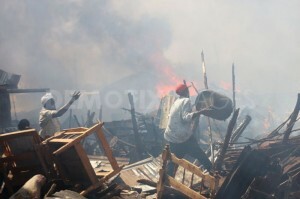 The cause of the fire is yet to be identified. Police helicopter was seen flying above the scene, several times, though there were no firefighters present. Residents managed to put off the fire after about 35 minutes and voting exercise continued without further interruption. This entry was posted in Elections, Kibera and tagged fire, IEBC, Kibera. Bookmark the permalink.